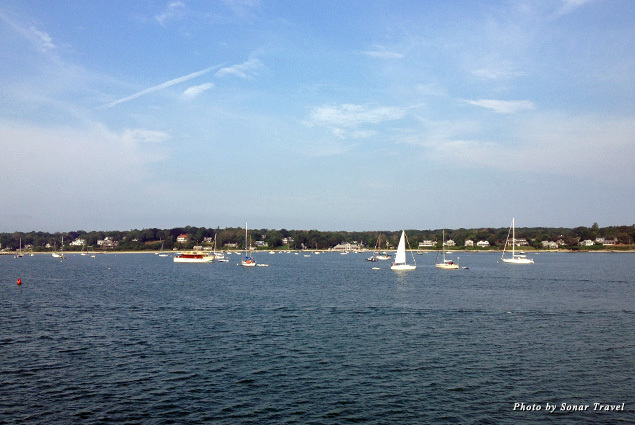 Put on your boat shoes and pack your nautical sweater and pearls; we’re heading to Martha’s Vineyard! 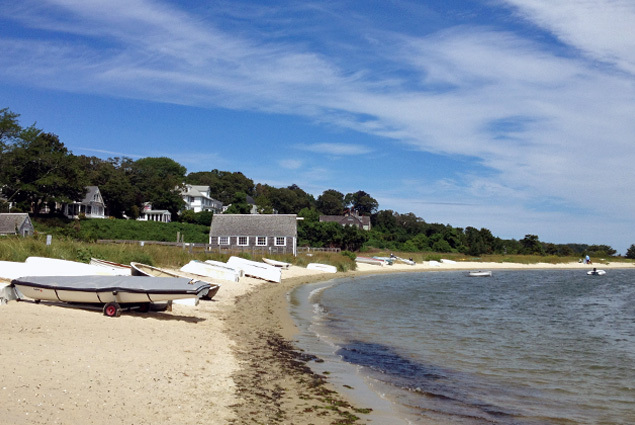 For such a tiny island, Martha’s Vineyard is jam packed with fun and infamy. 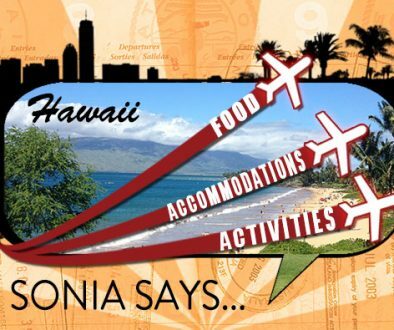 Just the very name conjures up images of President Obama biking in mom jeans, the famous Jaws Bridge, and a population of preppy, chic vacationers relaxing on the beach’s grass-covered shores. But before you hit the sand you have to get yourself onto the island first. 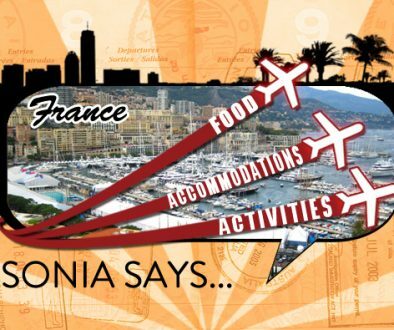 If you are one of the lucky few, a helicopter or a private jet is the way to go. 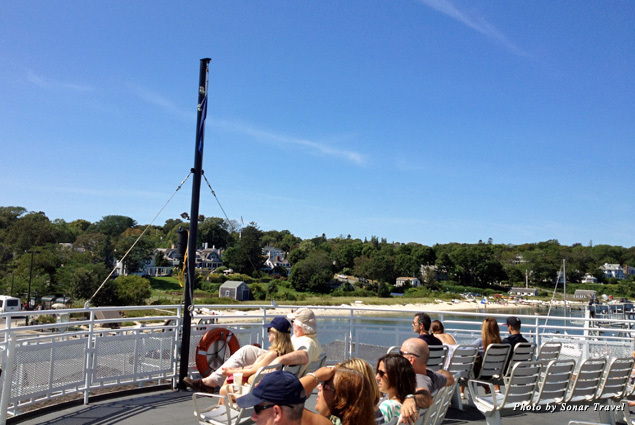 But for the rest of us, there is a more practical method: Drive yourself to Cape Cod, park your car, and hop on the Steamship Authority ferry for a quick ride over the waters of Vineyard Sound. It’s so very East Coast. Watch the Vineyard come into focus as you enjoy a coffee or a Bloody Mary and admire the beautiful homes and boats lining the island. 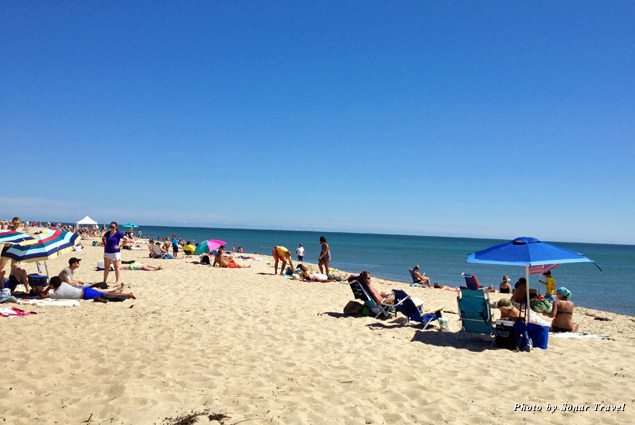 The most popular towns on Martha’s Vineyard are Oaks Bluffs, Edgartown, and Vineyard Haven; each has its own distinct flavor even though they are packed so close together. 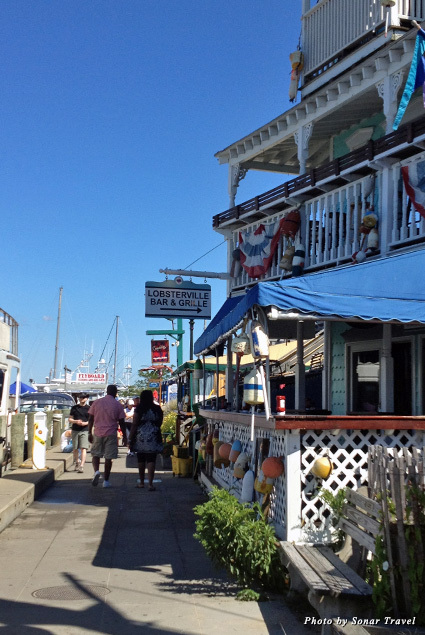 Vineyard Haven is quaint and quiet with small beaches, the well-known Black Dog Tavern, and lovely little shops. Edgartown is generally considered to be the more upscale area on the Vineyard, filled with high-end stores such as Vineyard Vines—an East Coast favorite—as well as fine dining and the aforementioned Jaws Bridge. 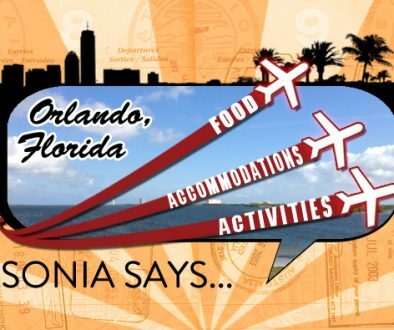 Oaks Bluffs is where the fun is, with its many bars and restaurants, shops, and the famous Flying Horses Carousel. 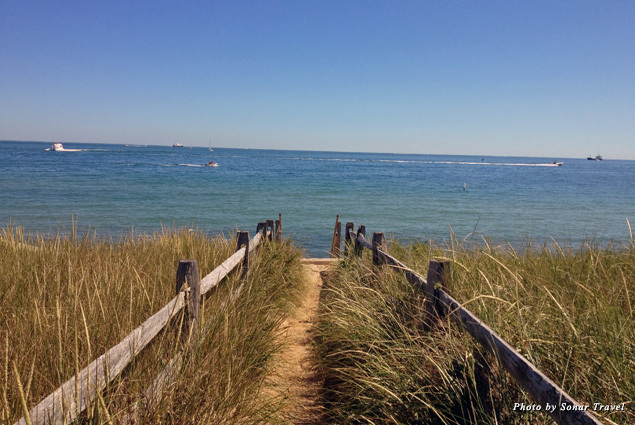 Other slightly less known areas such as Chilmark and West Tisbury are great for nature lovers and those looking to unwind in peace. You will even find an alpaca farm on the island. Although it may seem as though Martha’s Vineyard is the ultimate summer playground for the rich and famous, it is actually surprisingly low key and down to earth. Sure, there are plenty of mansions, but for every mega home there are a dozen adorable cottages. The most famous of these are the gingerbread houses in Oaks Bluff. These whimsical homes are brightly colored and intricately decorated, just like gingerbread houses. And they look good enough to eat. 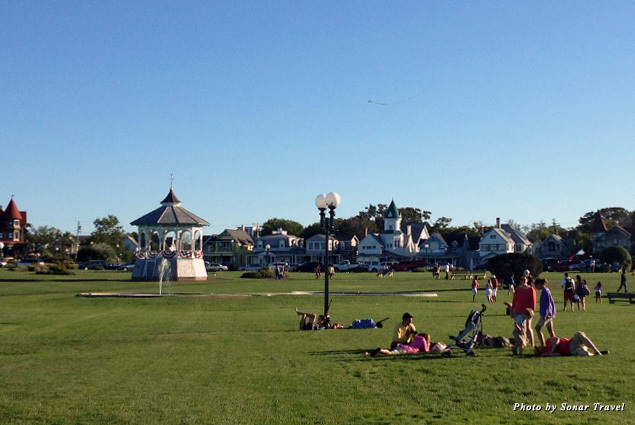 One of the most picturesque places on Martha’s Vineyard is along Seaview Avenue, where you will discover a bright green pasture filled with people playing Frisbee, going for a stroll, or splashing in the fountain. This little park is situated between the bright, blue ocean and the colorful, enchanting gingerbread homes. It is magical place to sit, enjoy an ice cream, and people watch. Just a few yards away is another delightful attraction, the Flying Horses Carousel. It is special not only because it is a National Landmark and the oldest operating carousel in America but also because these adorable horses transport you to another time. The young and old alike line up for a ride on these vintage stallions to test their skills and luck in obtaining the covered brass ring. 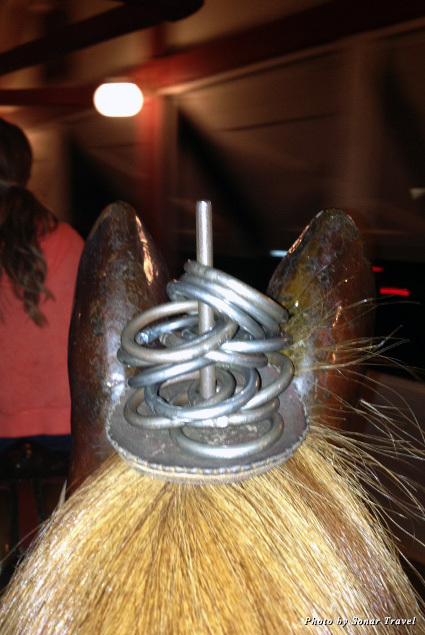 As you travel around the carousel, grab as many rings as you can and collect them on your horse’s head. Most folks can grab two rings at a time, but only a talented few can grab three rings in one fell swoop. If you are lucky enough to capture the brass ring, you get a free ride! Although Oaks Bluffs is filled with nostalgic charm during the day, at night it is the happening place to be. It may be because it is centrally located in between Vineyard Haven and Edgartown—or it’s because Vineyard Haven is a dry community, so if you want an adult beverage, Oaks Bluffs is the closest place to go. 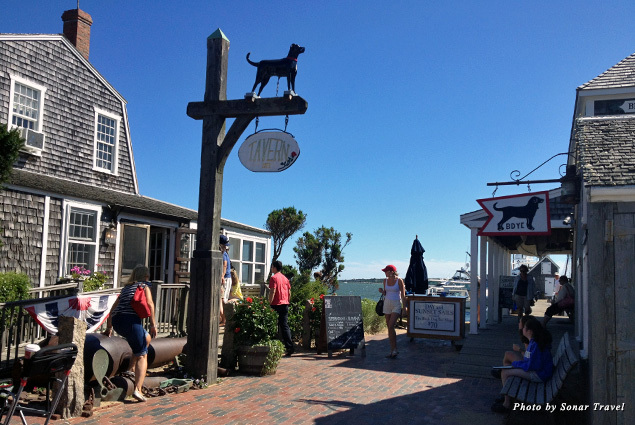 Although you cannot get a drink in Vineyard Haven, what you can get is a staple of East Coast fashion: the Black Dog T-shirt. You will see the silhouette of the famous Black Dog all over the East Coast and even more so when you arrive on the island. 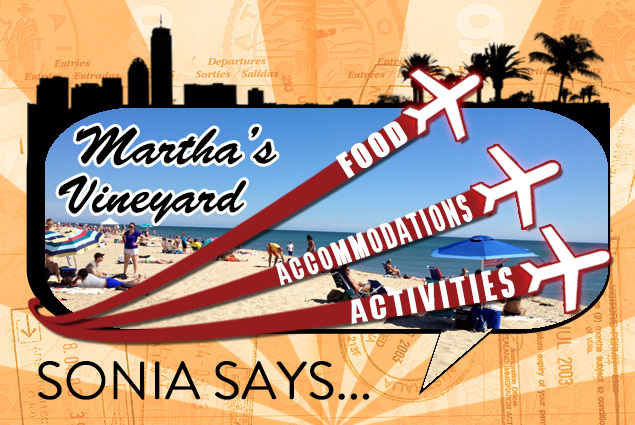 And although some may consider it a bit touristy, it has become a badge of honor to show you vacationed on Martha’s. From Vineyard Haven you can rent a bicycle or catch the local shuttle bus and head to Alpaca Island for some furry fun. 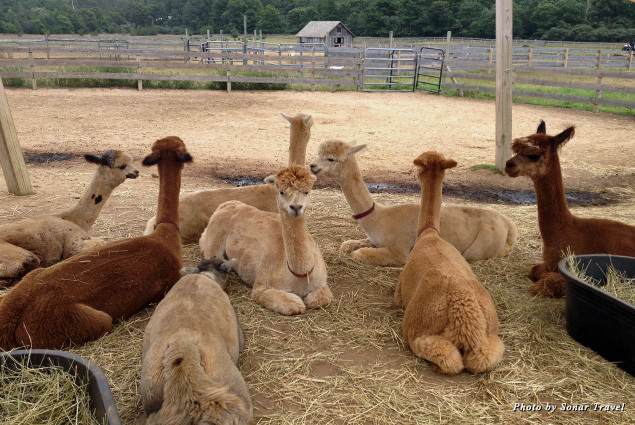 Alpaca Island is a breeding and sheering farm located in an antique barn that produces high quality wool. The alpacas are adorable, and if you find one you really like you can bring home a scarf or gloves made from that alpaca’s wool. If you visit during the summer months, you may even catch a glimpse of a baby alpaca, which is the size of a Great Dane. 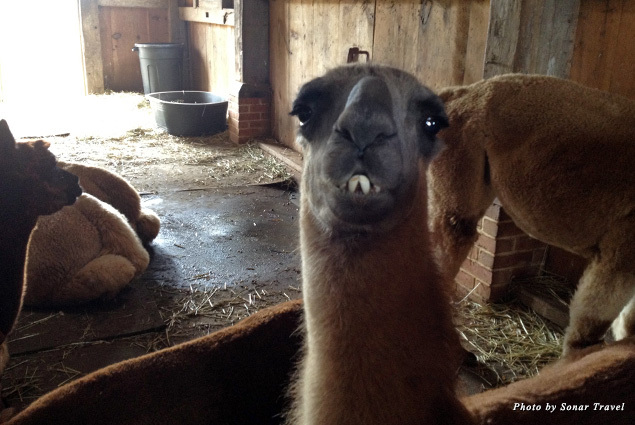 And a word of warning: Do not get too close the guard llama; he spits! 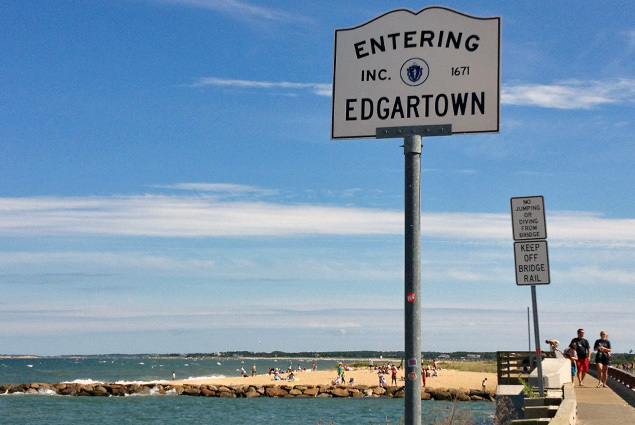 Edgartown is a quick bike or shuttle ride away. Movie buffs should keep an eye out for the settings of some famous scenes from the movie “Jaws,” such as the Edgartown and Chappaquiddick Island car ferry, which operates in the background when the Mayor and Chief Brody have a chat. Even more famous is the bridge where the shark swims into the inlet and traumatizes Brody’s son. The Jaws Bridge is actually called the American Legion Memorial Bridge and is located between the city limits of Edgartown and Oaks Bluffs. Jumping off the bridge has become a rite of passage and a summer tradition despite the numerous “No Jumping” signs and police officers standing guard. If you are brave enough to make the jump, you can be rewarded with an “I jumped off the Jaws Bridge” T-shirt. Not to brag or anything, but I totally jumped. And yes, it was terrifying! After the excitement of jumping off Jaws Bridge, you simply must enjoy the many beaches on the island. One of the most popular—and stunning—is South Beach. Unlike other beaches located on the mainland, this one makes you feel as though you are surrounded by beautiful blue waters and golden sand from every angle. It is truly one of the most magnificent beaches I have ever seen. 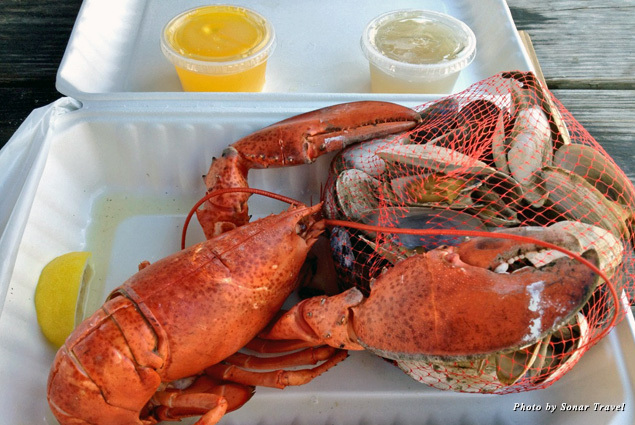 There is just one last thing you must do when you are on Martha’s Vineyard: Eat a lobster. Lobsters and fresh seafood are abundant on the island; you can find smoking deals on a whole lobster at just about every restaurant. 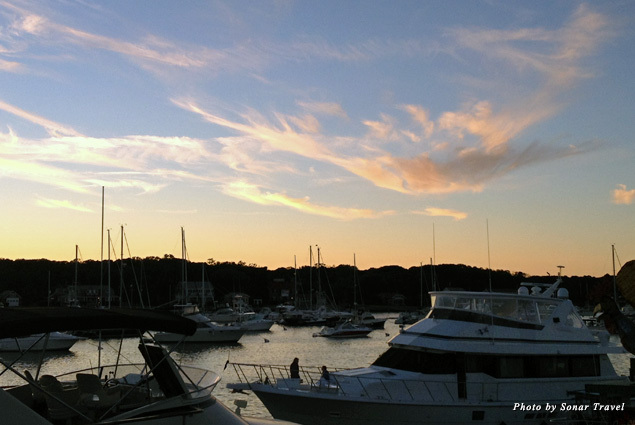 Pick a place with a fantastic view—which is not hard to do—then crack open a clam or claw and enjoy the sunset over Martha’s Vineyard.